Rights issues leave companies with cash, but sometimes also unfinished business. London-listed miner Lonmin and emerging market lender Standard Chartered raised a combined $5.5 billion on Dec. 11. The response should be relief, but shares in both have lagged where they ought to be. Lonmin got a cold shoulder from more investors, but StanChart faces bigger questions. Lonmin’s cash call was smaller at $409 million but more urgent. Its 46-for-one share issue reflects the dire straits in which its platinum business has ended up. According to the ex-rights price – or where the shares would notionally settle once the right to take up the offer price elapsed on Nov. 20 – Lonmin’s shares should have traded at 1.3 pence per share. Instead they fell 4 percent below it on Nov. 20 and by Dec. 11 that gap widened to 28 percent. The market hasn’t been kind to Lonmin. Platinum is down over 10 percent since its new shares were priced. South Africa, where its business mostly resides, is in political turmoil, and the currency is sliding. There’s another, downward force. Only 70 percent of Lonmin’s rights were taken up by investors, leaving around 28 percent of its newly enlarged stock in the hands of underwriters. That creates a big overhang. StanChart also has suffered because of poor peer-market conditions since it priced its shares. But investors, even though they took up almost all of their rights, are also giving a vote of diminished confidence. After StanChart old shares were shorn of the right to buy new shares on Nov. 23, the stock fell to 15 percent below its theoretical settling price. And the 9.8 percent further fall since then is worse than the decline in the Euro Stoxx Banks index. 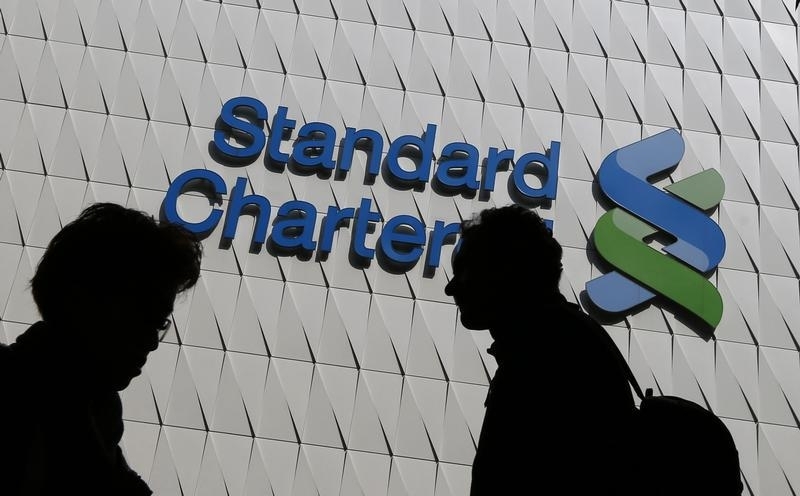 Standard Chartered and Lonmin both completed rights issues on Dec. 11. The emerging market bank had 96.8 percent of its $5.1 billion in new stock taken up by existing investors, while the UK-listed platinum miner only had a take-up of 70.9 percent on its $409 million issue. Standard Chartered had offered two new shares for every seven outstanding, at a price of 465 pence per share. That was a discount of 34.8 percent to the closing price on Nov. 2, and a 29.4 percent discount to the theoretical ex-rights price of 659 pence – the level at which the shares would notionally settle after the issue had been completed. Since Nov. 2, the Euro Stoxx Banks index has fallen 8.8 percent, according to Eikon data. Lonmin offered 46 shares for each one outstanding, at a price of 1 pence per share. That marked a 93.9 percent discount to the share price on Nov. 9, when the issue was priced, and a 24.5 percent discount to the theoretical ex-rights price of 1.3 pence. Since the issue was priced, platinum prices have fallen by around 9 percent, and the FTSE Mining index has fallen by 15 percent. Lonmin’s underwriters, HSBC, JPMorgan Cazenove and Standard Bank, will hold around 28 percent of the company. Standard Chartered shares were trading at 509.3 pence at 0900 GMT, flat on the previous day’s close. Lonmin shares were trading at 0.95 pence, 7.8 percent below the previous close.